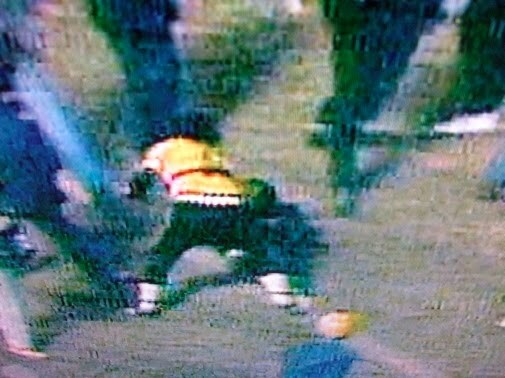 Dear 1979 Pirate fan… please tell me you still have this shirt! If you are out there and have that shirt, send me a picture of you wearing it NOW. 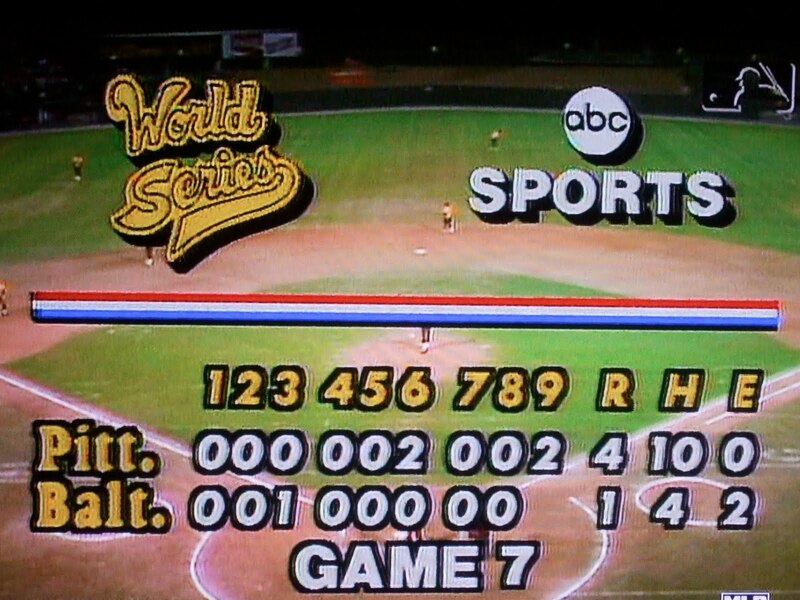 Do you know what was awesome about Game 7 of the 1979 World Series? EVERYTHING!!!! The other day, the MLB Network was showing Game 7 of the 1979 World Series, which is to date the last time the road team won Game 7 of a World Series. 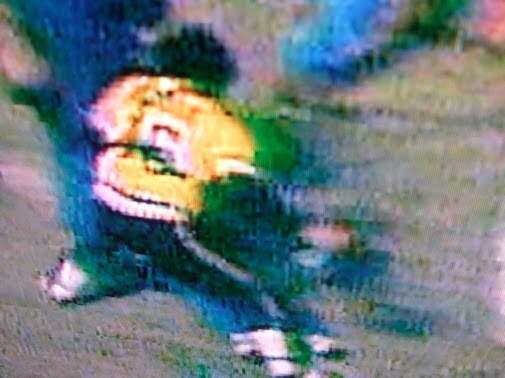 As I wrote in the Pirates Home Grown vs Acquired entry that the 1979 Series was the first one I have any real memory of. When my brother and I were kids, often we would stay at the home of our neighbors Peggy and Rico Bianchi until my mom and dad got home from work. And in that great October of 1979, I remember being a 7 year old sitting in their upstairs bedroom with a black and white TV on watching the games and becoming transfixed. 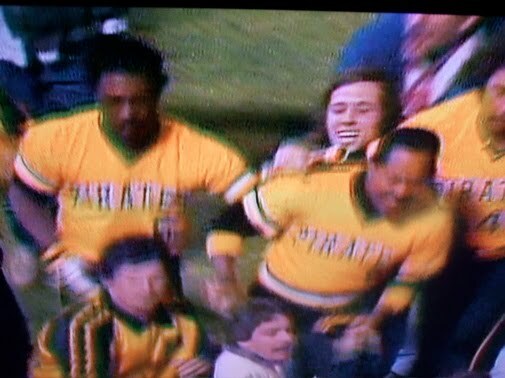 I remember “We Are Family” being played as the Pirates rallied. 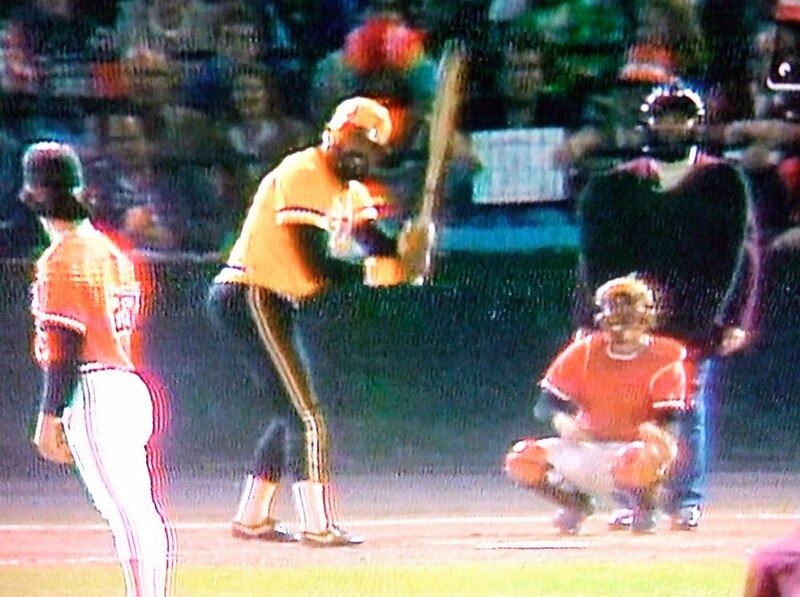 I remember Willie Stargell getting key hits after key hit and the Orioles having what seemed like 100,000 awesome pitchers. And keep in mind I originally watched it without color, and little did I realize just how colorful a World Series this was. Let’s list the cool things, shall we? I remember his 2 run come from behind homer off of Scott McGregor and not being surprised by it. That’s just what Pops was supposed to do! 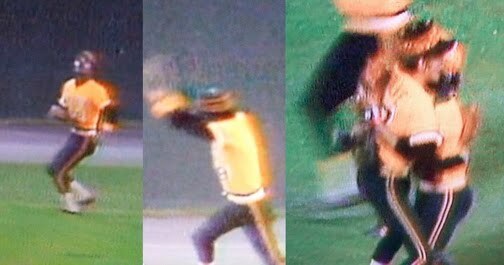 Only the most die hard Orioles fan could watch Stargell’s 1979 World Series and not have a huge grin on their face. 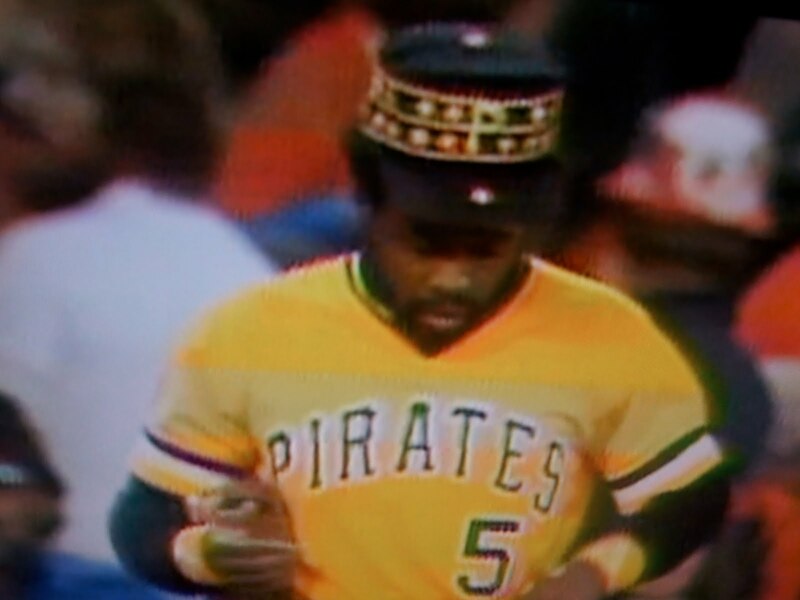 The last World Series of the 1970s made quite a fashion statement. 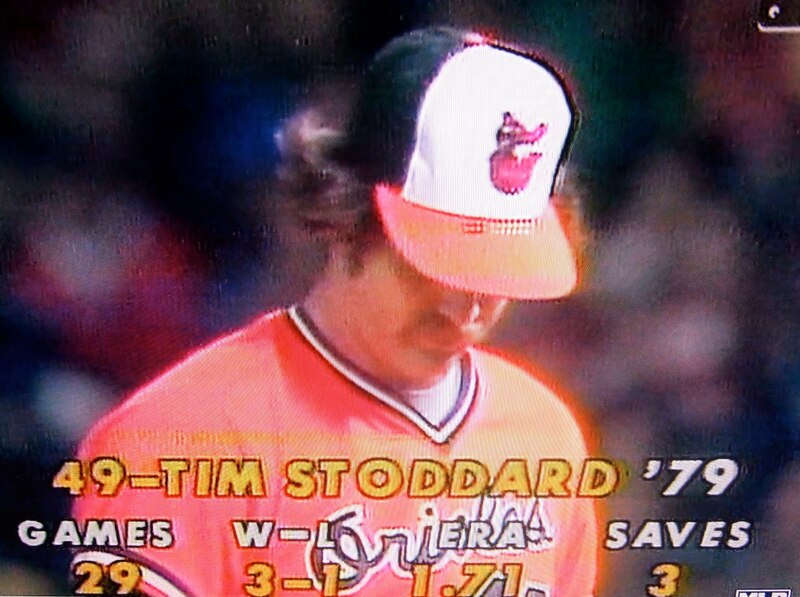 The bright orange duds of the Orioles complete with the smiling bird cap that will always rock. Both with the pullover double knit tops. They looked great on color TV. Imagine how they’d look in HD. We need a bright uniform renaissance. 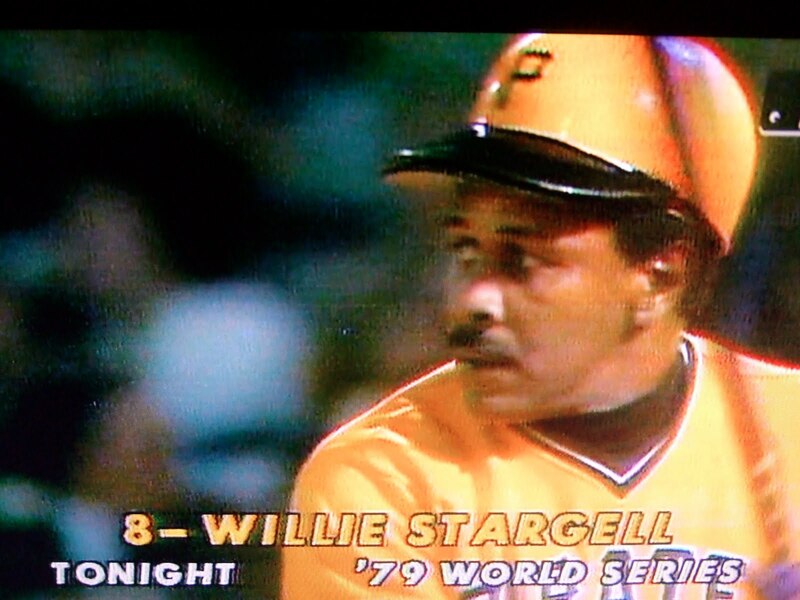 Captain Willie Stargell would hand out stars for great plays and clearly didn’t mind giving himself a few either. Each of the Pirates put the stars on their caps and often there was no uniformity in how they arranged the stars. 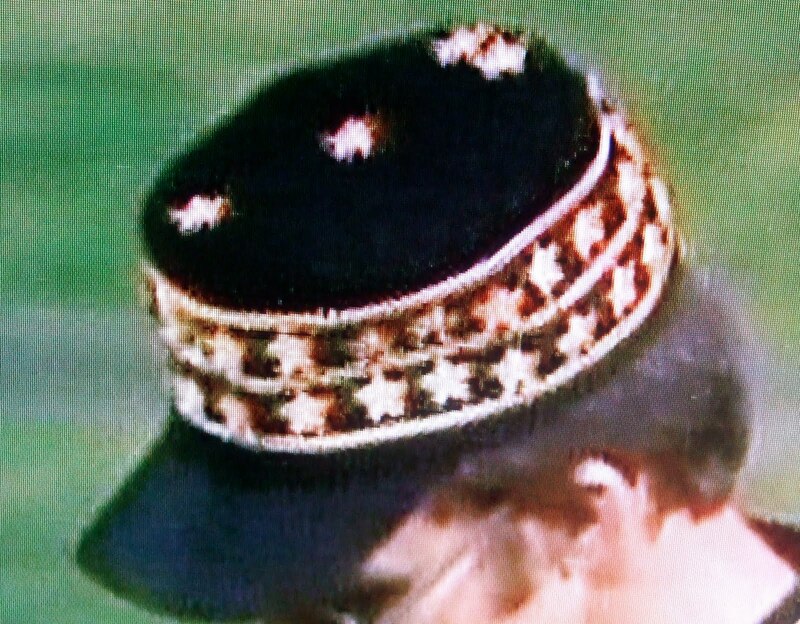 Here Kent Tekulve had a few on top of his cap as well as surrounding the crown. Today this would probably be banned by MLB for not being uniform. In 1979, it made the team a closer family. 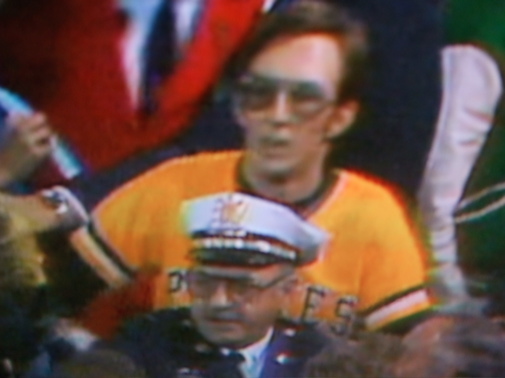 Has there ever been a more awkward looking closer than Kent Tekulve? 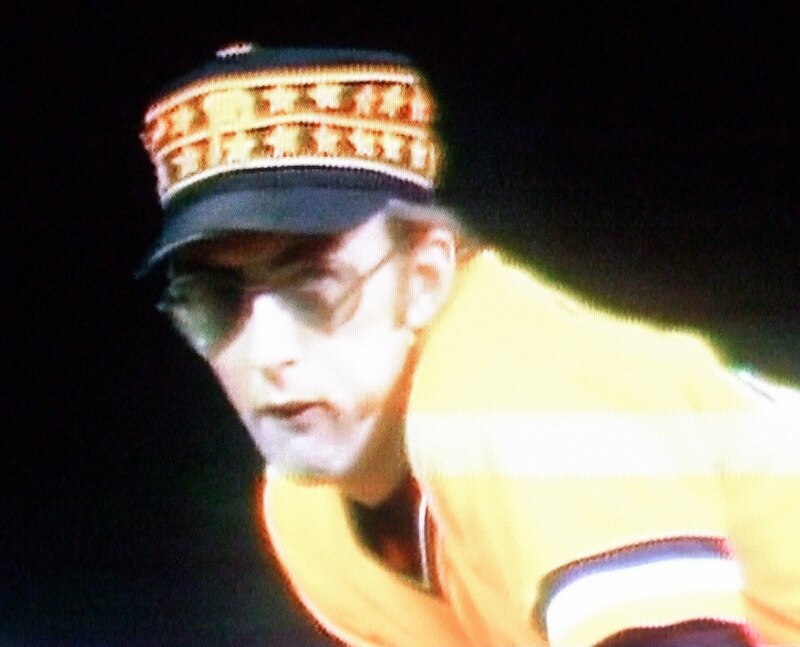 Tom Henke was a GQ model compared to Tekulve. He clearly wasn’t cut from the same intimidating cloth as say Rollie Fingers, Sparky Lyle or Goose Gossage. The high school science teacher face. Even how he threw was strange and not exactly pretty. He had that rubber band arm submarine motion where I am sure the batter just couldn’t see the release point at all. He wasn’t glamorous that is for sure, but he could get the job done on the mound. Now as awkward as he may have looked on the mound, just imagine how out of place he felt at the plate. 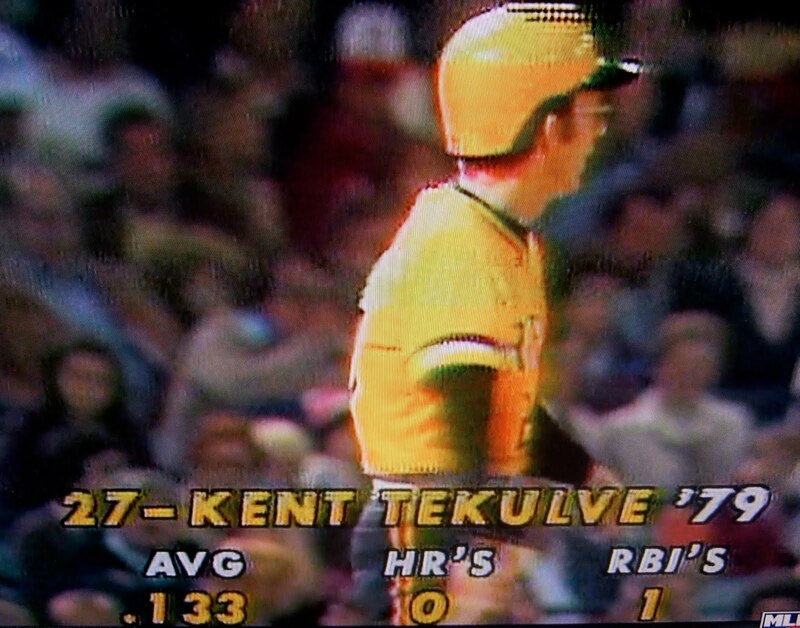 How the hell did Tekulve get a run batted in in 1979??? 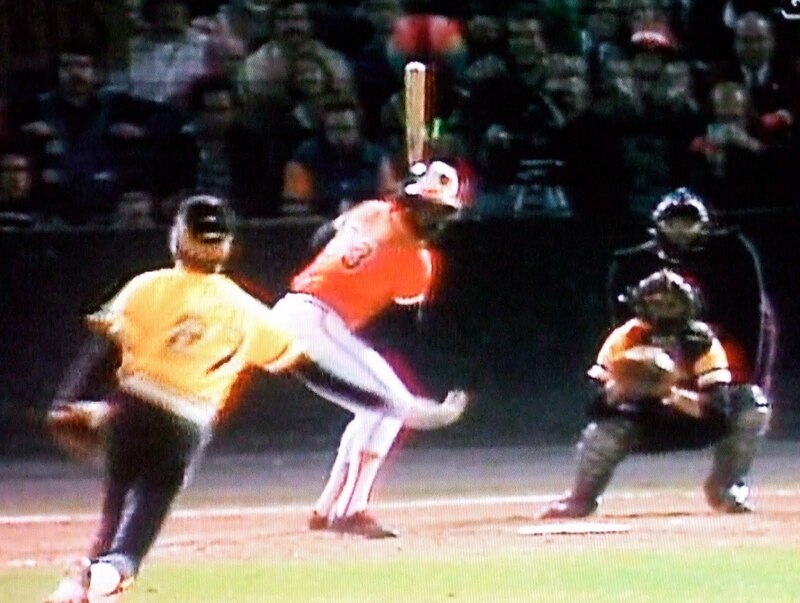 Eddie Murray, who could launch the ball from either side and managed 3,000 hits and election to the Hall of Fame, always was The Man at the plate. But late 70s Eddie was the coolest Eddie. The big fro spraying out from his helmet. The sideburns. The stache. The smiling bird cap that contrasted his scowl. And we can all admit the orange wrist bands were a nice touch. I intentionally made this picture bigger. It’s worth a close look. Heck, it’s worth making it the wall paper on your computer. Remember, he CHOSE this look. 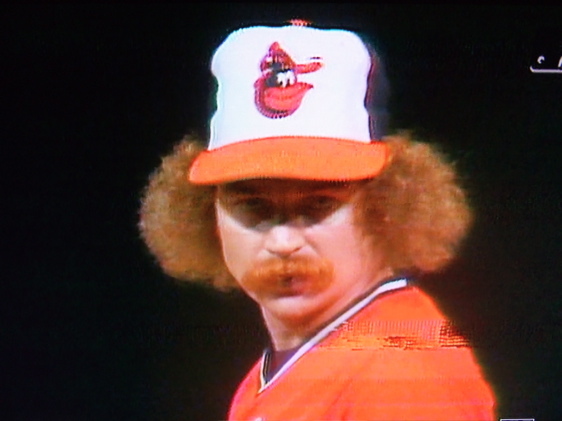 It’s wonderful that he has the hair that matches the color of his uniform… and his afro dwarfs Eddie Murray’s. What I am saying is, it takes some effort to make the smiling bird on the hat the SECOND goofiest face in this picture. 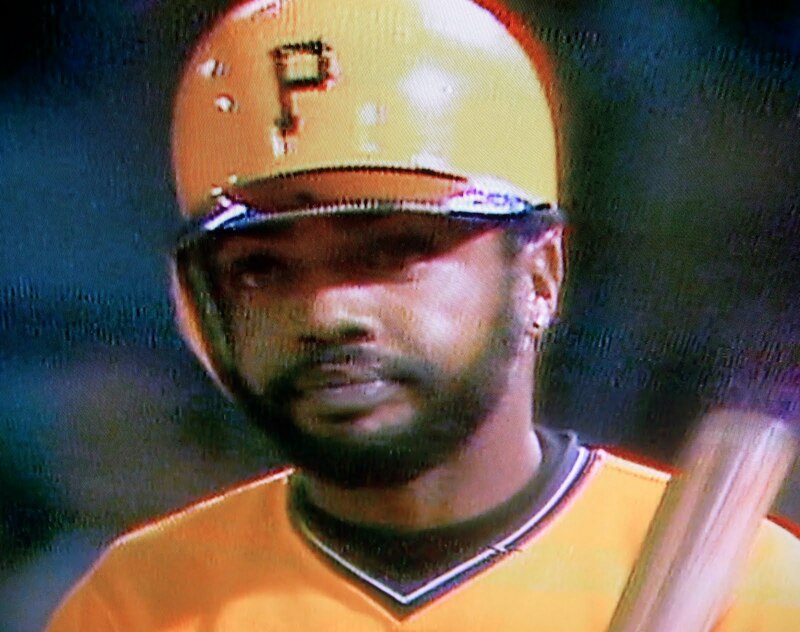 We forget now how great a player Dave Parker was in the 1970s. He was the MVP in 1978 and in the discussion for best all around hitter in the game then. 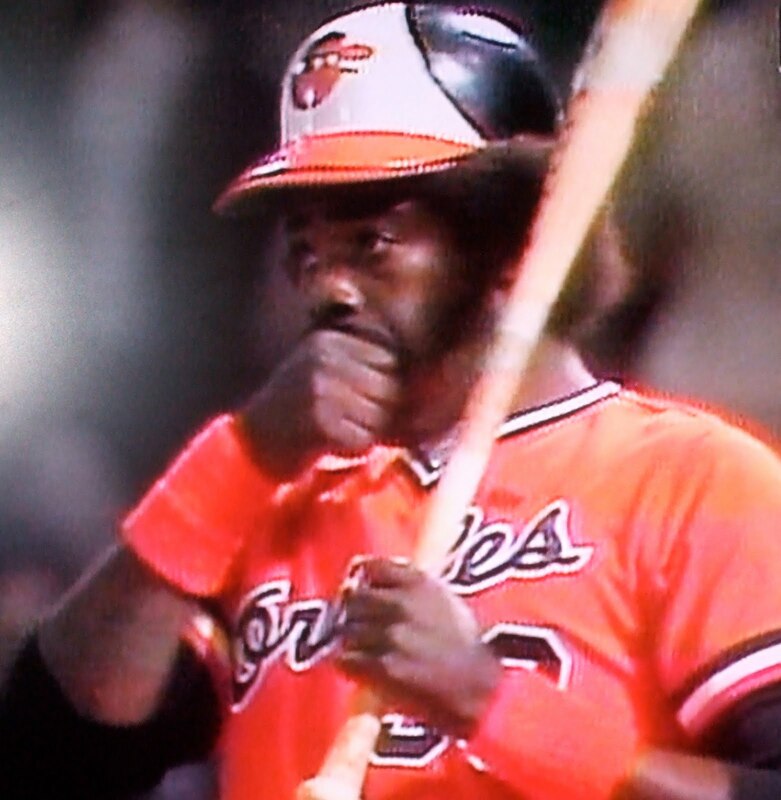 And like Eddie Murray he had a “don’t f— with me” aura that made him even more intimidating. Back then 20-30 homers meant something and he was about as physically intimidating a figure at the plate you could imagine in a pre steroids slugger. Parker wasn’t on the juice. He did manage to smoke a pack or so in the dugout during the game. Didn’t there seem to be more than two Roenickes? I could never get Gary nor Ron straight. Now there is a NEW Roenicke in the bigs. Gary’s son Josh pitched for the Reds and Blue Jays this year. 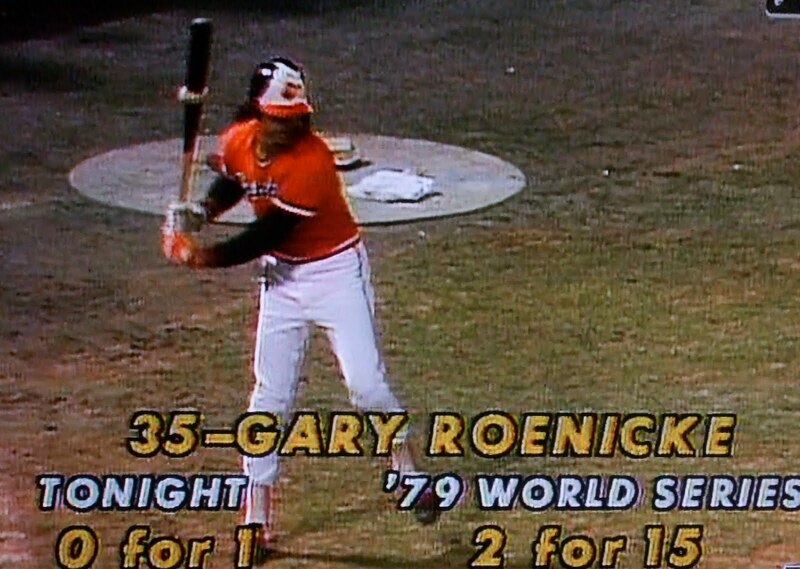 I wonder if he gets the Roenickes confused. 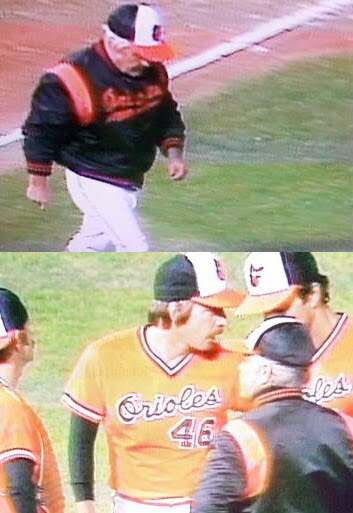 Trying to keep the Pirates from blowing the game open, Earl Weaver made about a thousand trips to the mound and made so many pitching changes that I think that if he could have activated McNallay and Cuellar, he would have. In all 5 pitchers pitched the 9th including eventual Cy Young winner Mike Flanagan and both Dennis and Tippy Martinez. I had to double check to see if I pitched. 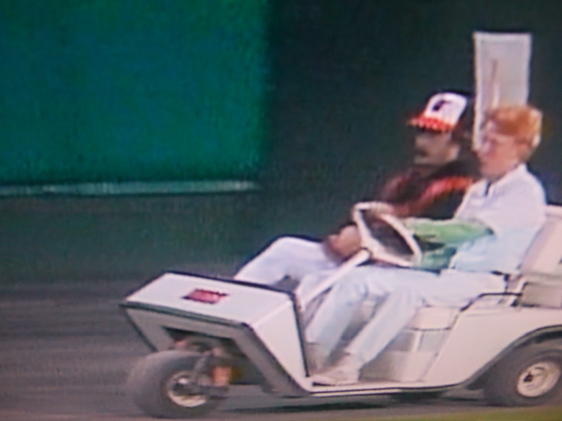 When did the bullpen cart become extinct? Seriously… one minute every pitcher was carted out, the next they are ambling in from the pen. Did they get a proper send off? Is there any chance they can come back? 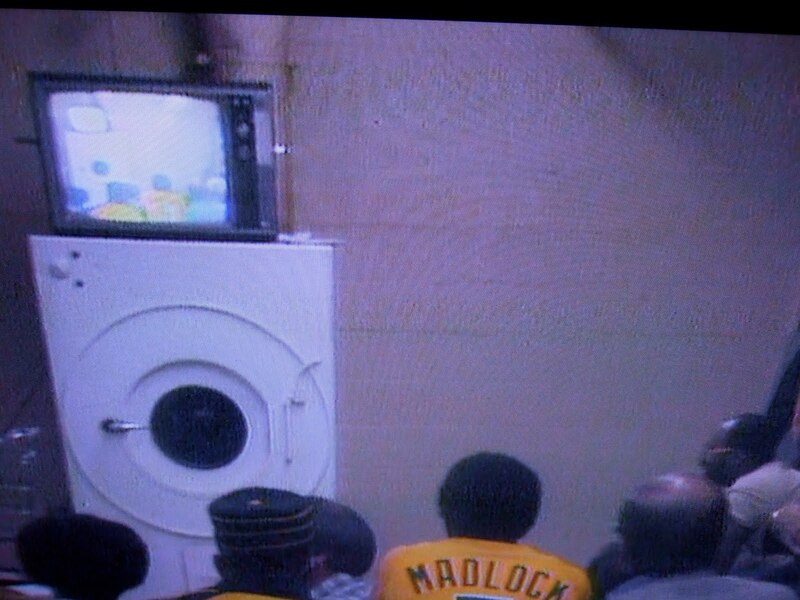 The Pirates in the locker room, including borderline Hall of Famer Bill Madlock, are watching the late innings. Today they would be in the spacious clubhouse watching on flatscreen TVs. In 1979, it is a crummy TV (probably a Zenith) sitting on top of a washing machine. Hey, it did the trick. Something they haven’t been able to say since. As was the norm of the celebrations in the 1970s, the objective for the winning team was NOT to celebrate on the field. There was no big elaborate pile and choreographed celebration on the mound. After Tekulve hugged Nicosia, it became the objective of the Pirates to GET THE HELL OFF OF THE FIELD AS FAST AS POSSIBLE! No doubt the mob would want to steal that television on top of the washing machine. The camera doesn’t focus on it. I know of no accounts of this happening. But I saw it with my own two eyes in the re broadcast. And I am not talking a half hearted punch either. He gives him a few haymakers and turns around and runs back into the dugout. The person he punched MUST be out there still. I would love to interview you. Can you IMAGINE that happening today? Carlos Ruiz or Jorge Posada clocking a fan on the field? They’d be forced to go on a public relations tour, apologizing left and right. Not Nicosia! He gets to beat up a guy and then celebrate with champagne. I kind of like it the 1979 way better. I’m sure Pirate fans do too. I hope reading this post made you hum a little Sister Sledge.